Our electronic design experts understand the unique challenges of the aerospace and defense sector and work together with our customers to drive the product development process forward. 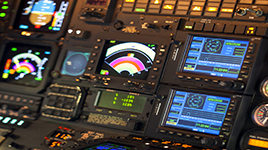 Our team of experienced RTCA/DO-254 trained electronic design engineers offer our customers the level of expertise needed to quickly overcome their technical challenges. At Hardent we understand that customers in the aerospace and defense sector rely on strict adherence to compliance requirements, which is why we are a member of the Controlled Goods Program. Contact our team for more information on how our services could help you quickly overcome your electronic design challenges.